Geneva - During a seminar organized by The Euro-Mediterranean for Human Rights Monitor in cooperation with CIRID Center on the sidelines of the 36th session of the Human Rights Council meeting, the Euro-Med asserted that Arab countries should strive to enable their citizens to exercise their legitimate rights, abolish policies of repression and restrictions and stop cracking down on human rights activists, especially in Bahrain. 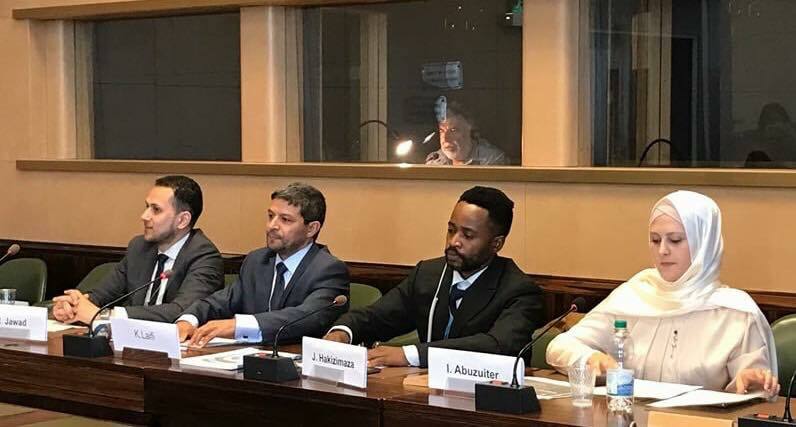 Mahmoud Jawad, an operations Advisor for the Euro-Med Human Rights Monitor, highlighted the practices of repression against the civil society activists in Bahrain. Jawad pointed out that human rights defenders in the country still face a number of restrictive measures, including denying entry to the United Nations Special Rapporteur on Torture, Professor Nils Melzer, to the country. Human rights defenders in Bahrain were subjected to cruel and inhumane treatment inside prisons, torture, shackling and detention in poor conditions that prevent them from getting the healthcare they need, pointing to the arbitrary arrest of about 20 activists during the last week of July. Mahmoud Jawad criticized the continuing repression of freedom of the press in Bahrain, where Bahrain was ranked number 142 out of the 180 countries that violate press freedoms listed in the 2016 World Press Freedom Index issued by Reporters Without Borders. In his speech at the seminar, Jawad warned against the new constitutional amendments in Bahrain - adopted on February 21, 2017 - which enable military courts to try civilians, in a clear violation of the fair trial standards. In addition, Jawad called upon the Bahraini government to fulfill its obligations under the international treaties it had signed and ratified, such as the International Covenant on Civil and Political Rights, and particularly the covenant’s provisions on freedom of speech, freedom of the press and the right to fair trial. Kamal Al-Aifi from Justice First spoke of the repercussions and implications of the Gulf crisis on the citizens of the Gulf countries, pointing out that these repercussions have had a serious impact on all social, political, cultural and economic aspects of citizens, noting to the media mobilization and incitement among the Gulf countries, which needs to be addressed urgently. “The Gulf crisis has caused gross violations of human rights, the most significant of which are the right to work, freedom of movement, education and family reunification,” Al Aifi pointed out. He also called on the international community and the UN special rapporteurs to take action and prevent violations suffered by the citizens of the Gulf countries. Regarding Education in Iraq, Iman Z’eiter, a Euro-Med researcher, referred to the World Education Quality Index issued by the World Economic Forum in Davos for the year 2015-2016, which confirmed Iraq's absence in any international classification for the quality of education, due to its lack of the most basic quality standards. “The Iraqi education system suffers an obvious setback in all aspects; the military operations in the cities and towns of Iraq have resulted in changing school curricula to match the beliefs of the groups that control these towns,” Z’eiter pointed out. In the aftermath of fighting, she added, a large number of schools were destroyed, school staff were forced to immigrate or were imprisoned in detentions centers. The conflict has resulted in students’ unwillingness to go to school and they seemed indifferent to pursue their studies. Z’eiter also mentioned a number of recent statistics that reflect the decline in the level of education in Iraq. Out of a 1000,000 first graders in 2005, about 600,000 students have gradually dropped out of school in the period between 2005 and 2017. Also, according to the statistics of the Iraqi Ministry of Education, only 28% of 6th grade students (the same students who joined school as first graders in 2005) passed the exams successfully, out of 226,000 who enrolled in 2017. The sectarian discrimination policies followed by the Ministry of Education have targeted students in the provinces of Anbar, Ninewa, Salaheddin and Diyala, causing students to fail classes, which has become a norm for the Ministry of Education, explained Z’eiter. Most of the educational institutions in Iraq have become an arena for sectarian dispute and a means for students’ mobilization and involvement in the militias and armed conflicts under the pretext of fighting the ‘Islamic State’.